A pedestrian-focused system with a consistent hierarchy for orientation, identification and interpretation. 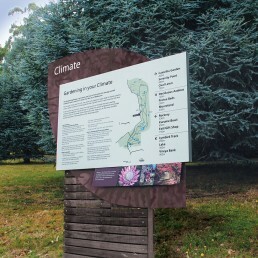 A distinctive design that complements the surrounding environment, with the rhododendron motif providing a link across signage types. With bold and creative use of timber elements, laser cut patinated metal and graphic motifs, this signage strategy was adapted and themed across four additional gardens within the region.